2 by 3 Heroes: How about an update? I know it's not midyear - that was 7 weeks ago. But I thought I would take a look at my 2014 goals and see how I am coming along with them. For those that need a review (and a pic of Kate Upton). The main part I want to look at, in this post, from the 2014 goals is parts 2 and 3: collection and organization. Both can be viewed through my Zistle account. The main thing I wanted to deal with for my collections was the ability to know what I had at a moments notice. Hence Zistle, which I absolutely love. I know there are a few other sites out there, but give Zistle a try. Lot of work on the initial setup, but then you fly through adding new cards. Granted, I only use Zistle for my customer collections - I have not posted every single White Sox or Blackhawks card I have on it. I may someday. But to be able to virtual dime box or be sure what I have in the stuffed binders, the site saves my bacon. 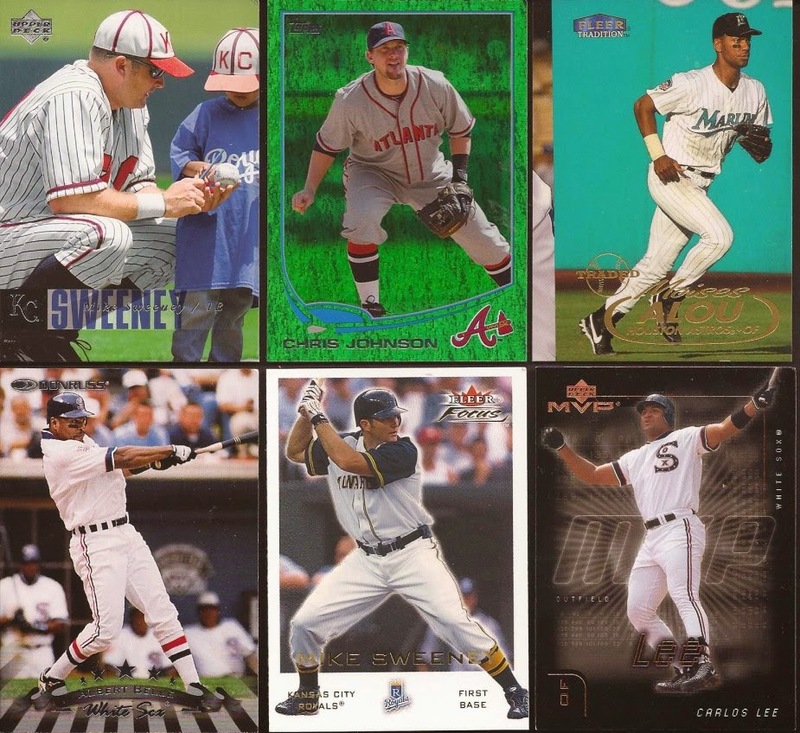 In regard to my custom collections, I had a simpe, fun, east goal of 450 different double play cards, 250 bunting, 300 throwbacks and 90 in my Ben Petrick PC. I have been doing quite well in all of those. Currently, I stand at 662 double play cards, 585 bunting (I am shocked there are this many), 443 throwbacks and 53 Petrick. I have far exceeded all my goals but the Ben collection. I am only behind, though, from lack of pulling triggers on a few shopping carts at COMC, Just Commons and Sportlots loaded with Petrick cards. But soon I will. 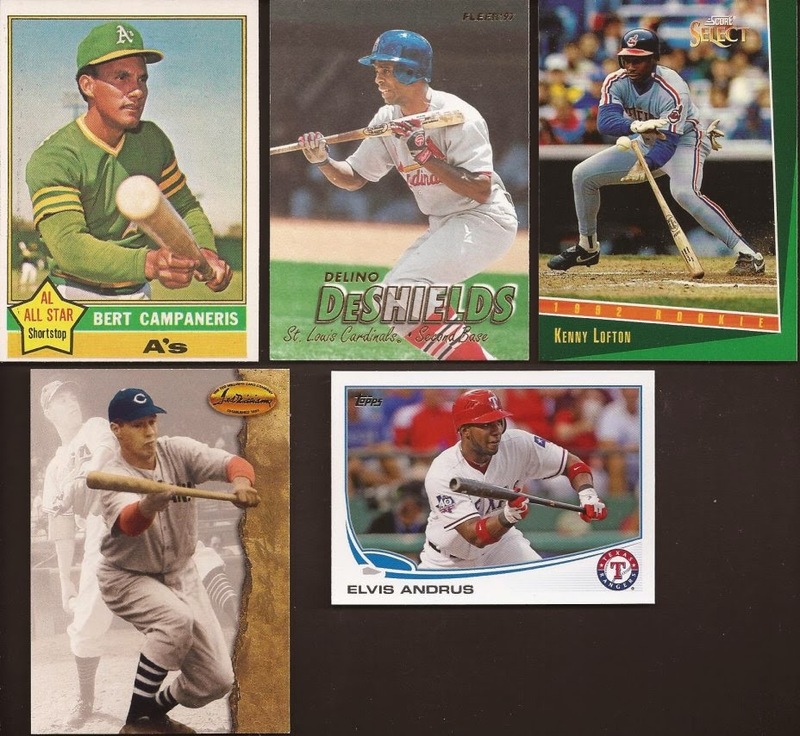 Of the over 1500 cards between DP, bunting and throwback, I am sure a good 50-60 are courtesy of Dime Box Nick envelopes. I swear, Nick. Within the next month or so, I'll text you to hookup in Rosemont and you can show me that awesome flea market in the old Horizon parking lot. 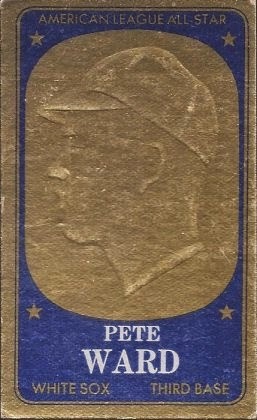 I am sure quite a few of my latest collection additions came from his dime box pusher. 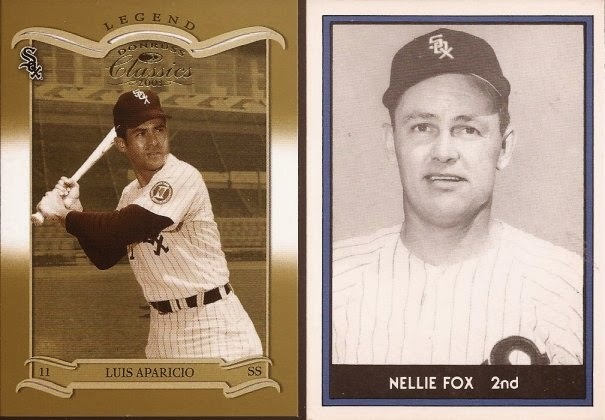 Granted, these are neither DP, bunting or throwback, but they are nice new cards into the projects for Fox and Aparicio. Love the simplicity of the TCMA of Fox. One of these things is not like the other. If you picked the miscut Alou in the upper right, pat yourself on the back. All the rest made it into my throwbacks binder. Lot of the awesome World Series throwbacks the Sox wore on Sundays a few years back. Too bad Carlos Lee can't blouse his pants properly. However, here is the real highlight from the package. Been wanting one of these '64 embossed cards for a while, and Nick hit the spot. They are really fun to have and far different in person that I expected. Though, I didn't expect too much to be different. Per Nick, this came from another magical Rosemont dime box. I am going to clean up when I get there. I may have to text Nick and make him drive to Harvey. I hear they have a mall with everything. Glad you liked the cards! We'll definitely do Rosemont any week that works for you. They're open on Sundays until the last week of October. I created a Zistle account recently, but I've been on the fence on if/when/what I should add to my collections. I was thinking about starting with cataloging a few of my mini-collections and going from there. It looks like a great resource.